Act now to prevent the adoption of strict, punitive regulations impacting opioid prescribing. The proposed Center for Medicare and Medicaid Services (CMS) regulations will significantly hamper our ability to provide individualized care for patients with serious or life-limiting illnesses. Porter Storey, Executive Vice President for the American Academy of Hospice and Palliative Medicine (AAHPM), recently highlighted this urgent need at a University of Colorado Palliative Medicine Grand Rounds, and AAHPM is currently drafting a letter of comment for CMS. We thought it important enough to share with the Geripal community because your stories matter. Time is of the essence. This is a call to action to comment on CMS-4159-P. 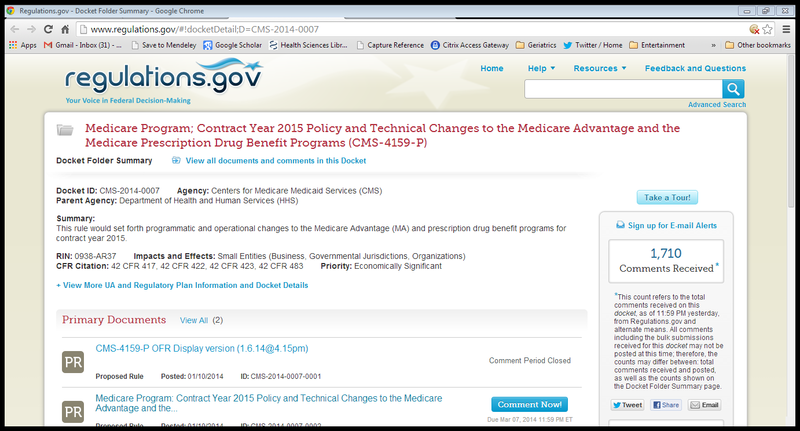 The proposed rule revises the Medicare Advantage program (Part C) regulations and prescription drug benefit program (Part D) regulations. As stated in the Executive Summary, one of the goals is to “strengthen our ability to identify strong applicants for Part C and Part D program participation and remove consistently poor performers.” While part of the intent of the revision is to identify inappropriate prescribing of opioid and other potentially harmful medications, these new guidelines may have significant unintended consequences, including limiting access to appropriate symptom management for patients with serious illnesses. “Instance where necessary evaluation could not have occurred"
“Prescribing drugs for indications not medically accepted"
1) A rural primary care physician serving as medical director for the region’s only hospice misinterprets the new rule and decides she can’t prescribe for patients she hasn’t seen because they live 100 miles away and can’t come to the office. This results in an entire region without access to appropriate palliative care. 2) A coroner draws opioid levels on a decedent with cancer who was on stable, but high-dose opioids and mislabels the case an opioid-related death resulting in loss of prescribing capabilities for a palliative care doctor. 3) A pulmonologist raises concerns that a patient was inappropriately prescribed opioids for dyspnea because the pulmonologist is worried that opioids might raise the patient’s CO2 levels, causing harm. This results in a claim that the opioid indications are not medically accepted, despite increasing evidence of benefit. AND, most importantly of all, you should be concerned because the proposed regulations lack a description of any form of due process by which providers would be able to describe the validity of their prescribing practice. In summary, the proposed rule, CMS-4159-P, has the potential to severely limit the ability of providers who care for patients with serious or life-limiting illnesses to provide patient-centered care. This aspect of the regulation needs to be withdrawn or significantly revised to recognize that so-called “improper prescribing practices” is a nebulous concept without a solid scientific definition. There are examples of non-FDA approved uses of medications that are considered best practice or standard of care in certain medical specialties. As currently written, the regulations fail to describe how improper prescribing practices will be identified and adjudicated. For primary care physicians, who currently fill much of the need for symptom management in advanced illnesses, the vague terms in this regulation jeopardize their long-term ability to prescribe medications for any Medicare beneficiary enrolled in the Part D program. So, dear reader, please contact CMS. Tell a story of a patient you care for, and how your goals are patient-centered care. Describe how your patient wouldn’t be eligible for a clinical trial and thus, you are using your medical judgment as you prescribe medications and make dose adjustments based on treatment responses, like pain relief, quality of life, and improved function. Describe how you do a significant amount of follow up and care coordination with caregivers and your clinic team because your patient is too ill to travel to your office. Describe your efforts to monitor for misuse or abuse, and how you prescribe the lowest effective doses, which still may be much higher than average doses that work for other patients outside of palliative care. Take Action Now – Comments are due by March 7, 2014. You can read the PDF of the proposed rule here, but for time’s sake skip to the last 2 pages. By: Hillary Lum and Paul Tatum. Special thanks to Porter Storey for raising our awareness, and members of the AAHPM policy committee for quick review. If you’ve read this far, take a few more minutes and submit a comment to CMS. March 7 will be here soon! Thank you for bringing this to my attention. I agree with your concerns. For those of us who are full time clinicians (I got two new consults in the time it took me to read the post), it would be very helpful if you or someone in your organization could draft a response to CMS that we could edit and then send, as other organizations often do. Thank you again.